This aspect of nonviolence is generally called a constructive program. In the long term, a constructive program provides the glue that keeps movements together, building on the spontaneous energy that may erupt in the face of some severe injustice and preventing that energy from melting away when the injustice has been addressed or the movement meets with unexpected resistance. These are strategic advantages that rest on the fact that nonviolence, as a positive force, lends itself even more natively to “cooperating with good” as King would say, than to “noncooperating with evil,” though that, too, has its place. Confrontational nonviolence, or what I like to call “obstructive program,” can be very effective, indeed dramatically so, but it requires that we maintain momentum and group solidarity until an opportune moment arrives. It also requires that we make progress without provoking undue hostility from our opponents and that we demonstrate our underlying commitment to the well-being of all, so as to leave the least possible legacy of bitterness, neither of which is always easy. Finally, oppression operates on the false assumption that the oppressed are helpless and dependent, but confrontational nonviolence does not always help to convince ourselves, our people, and in time the oppressor that we can govern and provide for ourselves…. 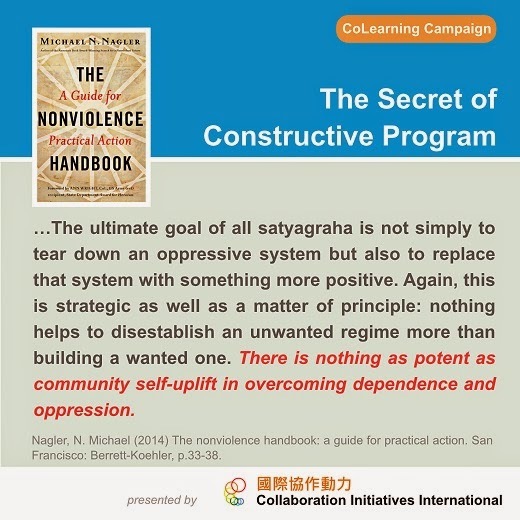 Nagler, N. Michael (2014) The nonviolence handbook: a guide for practical action. San Francisco: Berrett-Koehler, p.33-38.